VERSION 2.1.9 – This program will automatically bring together all the files you need to unlock and root your device in a few clicks, or flash it back to stock and re-lock it. You can also use this program to backup/restore all your important data, flash zips, set file permissions, push and pull files, install apps, generate logcats/bugreports, and much more! With the included file association options, you can perform tasks like flashing zips, installing apps, restoring android backup files, and flashing/booting img files with just a double click! The program includes a full featured interface for automating tasks in TWRP, enhanced restore features, an in-built auto-updater/notification system, ‘any build’ mode, advanced restore features,’NRT- Live Log’ for viewing the adb/fastboot cmds that are run in the background, quick tools utilities, utility set for merging custom build.prop tweaks, and tools for taking screenshots/screen-recordings. All the latest official Android builds and Nexus devices are supported. The program intelligently and selectively downloads the files it needs for your device and makes sure you are using the latest files available. The program can even auto-detect your device and build. This release brings official support for the new ZIP style factory packages. Check out the updated changelog for a more comprehensive breakdown of the feature set and changes in this release. · Install correct ADB/Fastboot Drivers. · Auto-detect device and build. · Auto-download all required files with hashcheck verification. 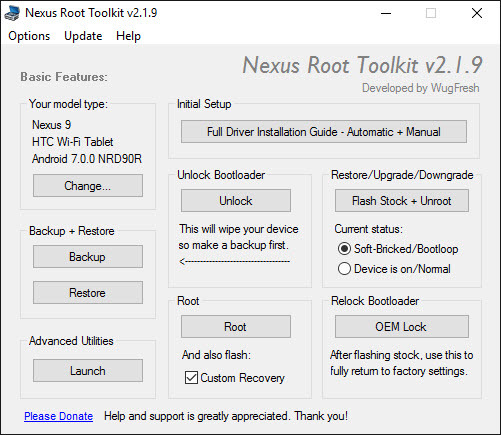 · Automatically root any build on all Nexus devices. · Flash Custom Recovery (TWRP/CWM/Philz/Other). · Restore/Upgrade/Downgrade to any android build. · Recover device from softbrick/bootlooped state. · Intelligent device/bootlaoder variable checking to prevent flashing incompatible firmware. · Dual-mode ADB/Fastboot intelligent connectivity checking. · Create Android Backup files for individual or all apps. · Backup & Restore Virtual SDcard. · Backup & Restore SMS, Call Logs, APN. · Create Full Nandroid Backup with Custom Recovery. · Fastboot Flash IMG files to any device partition. · Flash No-forced Encryption Boot.img. · Fastboot Boot IMG files (Boot.img/Recovery.img). · Fastboot Boot Custom or Stock Recovery. · Sideload OTA Update zips. · Flash zip files (Roms/Gapps/Etc). · Push/Pull files to any device partition. · Push/Pull on-device hashcheck verification system to ensure complete operations. · Enter manual ADB/Fastboot commands. · [NEW] Merge and manage custom build.prop tweaks. Configure your drivers if you haven’t already using the driver guide (If you aren’t sure use Step 3 of the driver guide to test your drivers). If you need to, backup your important data. Chainfire for developing SuperSU and all things root. AutoIt forums for lots of helpful information! AndroidFileHost.com for hosting and API access. Gist.Github for hosting the masterlist files.